Last edited by JKTUNING on 2014-01-08 at 17-02-57.
lynchfourtwenty, amdeman, and Kyle like this post. NEMU SA Tuning Package : Speed Density using the OEM ECU! My numbers are a little different. No, but your base pressure will make a difference! Ok. I'm still running 3bar base pressure. 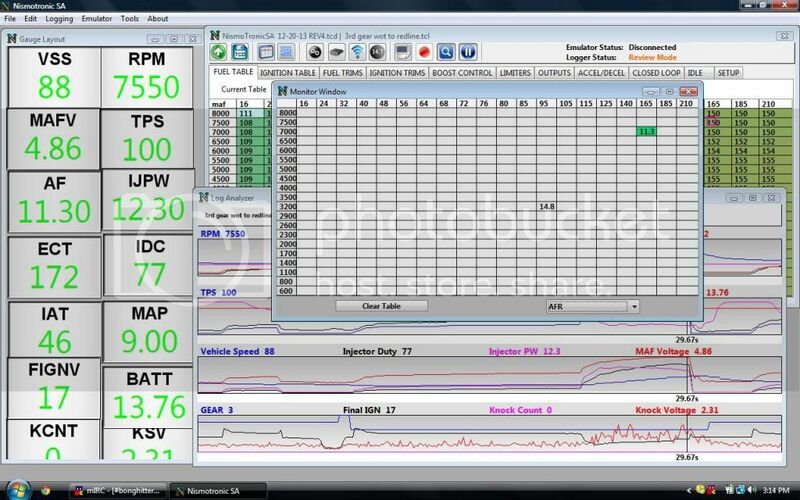 What better tuning software/ecu could you ask for? I mean he only takes our requests/comments/questions and implement them into the software! not sure if this is related to the update but i just noticed that the monitor window cells arent matching the rpms or fuel map cells when traced, heres an example..
Nice, I think this will help people going forward! That picture looks like it is tracing properly.. the tracer matches the green highlighted cell on the fuel table. If you send me your tcd and TCL I can take a look. But I didn't touch anything that would have to do with how the monitor window tracing works. (Edit: I see what you mean.. it isn't following it past 7500 like it should.. does it trace the rest of the table OK? Last edited by JKTUNING on 2014-01-09 at 03-27-28.
load wise it seems on, rpm wise its off all the way throughout the range..